NASA’s Curiosity Mars rover has been cruising along the martian surface for some time now. It doesn’t move particularly fast, and in the years that it’s been exploring Mars it’s only tallied about ten miles of actual distance, but the red planet is a particularly unforgiving place for a robot with metal wheels and not much tread. Thanks to a recent examination of Curiosity’s aluminum feet it’s become abundantly clear just how brutal the rocky surface has been, and NASA has discovered that two pieces of the bot’s left middle wheel are totally busted. 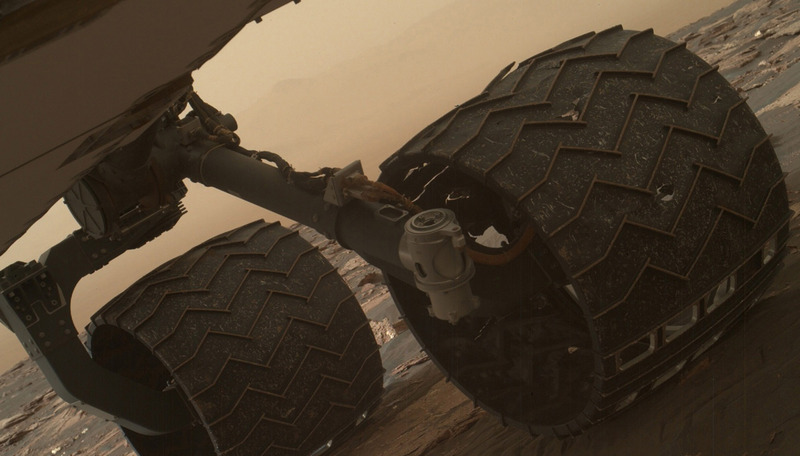 Curiosity’s wheels have raised treads that give it a firm grip on the rocky, dusty Mars surface. They’re called grousers, and since the rover can take some pretty fantastic selfies to show NASA what condition it’s in, we now know that two of the grousers on one of the bot’s wheels are busted (the raised chunk of metal on the top of the wheel in the photo below is one of them). Having a partially bum wheel isn’t the end of the road for Curiosity, however, and NASA expected and planned for just this type of news. The agency says that, based on Earth testing of the longevity of the rover’s wheels, losing three grouser on a wheel means that it has about 40 percent of life left before it gives out completely. And, since Curiosity has already passed the 60 percent mark in its overall mission, finding a pair of busted treads at this stage of the game isn’t great news, but it’s also nothing to panic over.